Google+ Mom to 2 Posh Lil Divas: My First Blog Award! 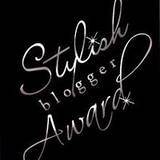 Talk about having a good morning - I woke up this morning and found that I had been awarded the Stylish Blogger Award by not 1 but 2 bloggers yesterday! Can you say AWESOME!!!! 2. I HATE onions - yes hate is a strong word, but really I do hate them! The smell, the taste, the burn to my eyes - not my idea of fun! My husband loves them so I am forced to cook them for him sometimes & I SUFFER! See what I do for love, he has no idea! 4. Since having my girls I am a Night Owl (aka a horrible sleeper). I am up way too late at night surfing the internet, reading or just watching tv. I get this second wind right around 9pm and am up till after midnight. I try to lay down and my mind thinks of a million things I forgot to do or need to do and well - no sleep! 5. I am afraid to be alone in my house! I have pretty much always been a chicken - needed to sleep with my back to a wall, all dorrs closed, etc.... It's pretty much followed me into adulthood - I can not take a shower when the hubby is working late and not envision that scene from Psycho and think someone is about to kill me! Talk about speed showers! lol! 6. I love Sweet Tarts - they are horrible for your teeth, it's like ingesting purse sugar but they are a serious weakness! I always have some hidden away! 7. I am addicted to Mystery/Thrillers - books & shows. I love trying to uncover the mystery and figure out who did it and why before the end! I am pretty good too if I may so myself! Ok, that was 7 - not so bad! Hope you learned a bit more about me that I hadn't previously shared! Also congrats for yours!!! I love books, too!!! Have a bigggg pile of them back at my mom's home in PR (when I have my own house, they'll come here)...and another on my apart. Can't have enough! Loooove your blog! Thanks so much!!! I was just coming to tell you that I was giving you one too :) You know you are well liked!!! Thank you so much for such an awesome award! Stop by today I gave you a shout out! Congratulations on your first blog award!! :) Thank you for following me! I'm following back! Hi! New follower! I'm a total spaz about being alone! I hate walking into another room! LOL. Congrats on the award! And thank you so much for choosing my blog, A Balanced State of Mind! This is my first one too! I will post my acceptance tomorrow (well technically later). I hope I accept it properly! I always love when I am found or find new blogs myself. Thanks so much for the reward and following. Looks like we are both "southern" girls.